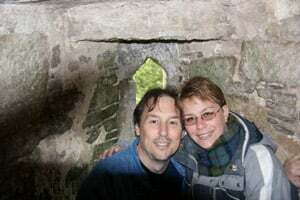 We chose to go to Ireland for the honeymoon because we had a trip in February 2007, for a long weekend to explore Dublin and we both could not wait to go back. The Irish people are some of the friendliest I have had the pleasure of meeting and I have traveled in Europe quite a bit. The countryside is exquisite with so many shades of green that it is hard to imagine or describe. We planned a tour of some of the more popular sites to visit as well as a few out of the way places. Our favorite things were getting lost, which we did a lot of, but finding some of the most amazing old ruins and seeing the rural areas of Ireland make it all worth while. And getting to see in person all of the beautiful old places I have seen in pictures only. It was a bit on the expensive side but well worth it for a dream trip at $4,116. We would hardily recommend going just about anywhere in Ireland, But you really have to rent a car, because while the bus trips will take to you to the more well known site, you will be there with 100 of your closest travel mates as well. Plus getting lost and discovering cool out of the way places is so much fun. Seriously, you can only get but so lost in Ireland it is an island and all the roads do eventually lead to a town. The winter season is mild so even travel in the colder months is not really all that bad. We have also been over in early spring and the parks all filled will flower about to burst in to bloom. 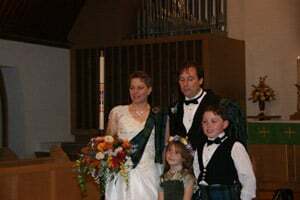 We left for our honeymoon on Saturday October 11, 2008 after an amazing Irish wedding and reception. We were both starved after getting to the airport, who knew that after all the decisions on a caterer and food that we would hardly get a bite much less a whole meal to eat. So our first real meal as husband and wife was airport Chinese food and it was wonderful, but being so hungry may have had something to do with it. The flight to London was uneventful and we were able to catch a few winks. After some delays in England we finally reached our destination of Dublin, Ireland. We got a cab from the airport and went to the Christchurch Hall Apartments, where we were staying for the night and decided to take a quick nap and then go find some dinner. We slept much longer than expected and so when we went across the street to the "Pale" they had already stopped serving food for the evening. We were directed by a rather drunken Irishmen (imagine that) there was a great place to get seafood just around the corner so we walked to the "Bull and Castle" for our first dinner in Ireland. The next time we are in Dublin that will be "the" place to go. The food was quick and delicious and the pints were ice cold. By the time dinner and drinks were finished so were we. So back to the apartment for nap part two. We rented a car the next morning to start our 10-day Irish adventure. We had a good laugh about that because the car they gave us was a Volvo S40 which was the car the rental place at home tried to give us as the wedding "limo". Our first destination was The Bog of Allen Nature Centre in Lullymore, Rathangan in Co Kildare. Now if you have never been to Ireland there are three phrases to be suspici ous of. The first is "You can't miss it". The second "It's just around the corner" and the third "It's clearly signposted" We like to say these are the three Irish lies. We have never had so much fun getting lost or finding incredible things we would have missed if any of the three were true. So on the way to the Bog of Allen we got terrifically lost and found The Lullymore Children's Centre and while the park was officially closed for the season when they found out we were on our honeymoon we were invited to walk around and see the gardens and nature trails. We were able to get some further direction to find the Bog of Allen and with some more searching and getting lost we finally stumbled upon the Bog. There we learned about the history of the bogs of Ireland, of which the Bog of Allen is the largest raised bog, as a rich, vital and endangered habitat for thousands of species of plants and animals. The bog's can also contain a vast array of treasures including, wooden boats, stone ax heads, mummified bodies and bog butter. They have several large areas to show what the difference between wet and dry bogs as well as greenhouses the highlight the types of plants that call a bog home. Of particular interest were the carnivorous plants they had in the greenhouse. Bryan had never seen a Sundew before but had seen the Pitcher plant and Venus Flytrap. From Lullymore, Rathangan we drove to Cashel in Co. Tipperary. The rain had started to move in so we settled in a pub for a pint then went to check in at the B&B we were going to stay the night at called the Ladywell Inn. The rain let off so we took a hike up the road to the Rock of Cashel and while the castle was closed for tours for the evening we were able to follow a narrow (goat) path around the castle just before the sun set for the evening and were able to get some really great shots of the Rock at dusk. We had a quiet take out dinner in our room that evening and to bed early so we could be at the Rock first thing for the tour. However the Irish rain had a different plan; the next morning was dawned grey and very wet. In fact we got such a fine downpour that we decided to skip the tour of the Rock as most of the tour is outside. We left Cashel to head off to Waterford in Co. Waterford for the famed Waterford Crystal tour. The rain was a constant companion so it took us quite a bit longer to get there then anticipated. The factory is huge and the tour takes you through from the first step of making a wooden mould to the last step of cutting and engraving the crystal. The tour takes a little over an hour to complete and you get to see up close every step of the process. The artists are paid by the piece and at any time the piece may be "reclaimed" if it does not meet Waterford's high standards. Reclaiming simply means that the piece is broken and mixed back in to the raw ingredients to make more crystal. One of the most interesting displays on the tour was the ball that is dropped every New20Years in Times Square. Each year after the New Year festivities the ball goes back to the factory and they replace 72 panels with new designs. The gift shop is a great place to find bargains on any type of Waterford product you can think of. Plus for a very small charge you can have them pack and ship the items home for you. 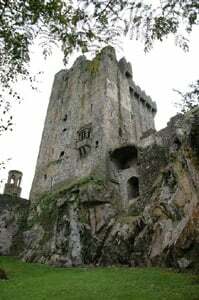 After leaving the crystal factory we headed for Tower, Blarney in Co. Cork. The Blarney Golf Resort was our next destination where we were planning to stay for three nights and see the sights. Again we got very lost trying to find the resort. We went into the town of Blarney for dinner and ate at a small place called Mackey's Bistro; we do not believe there is any relation but who knows. We got an early start and headed off the Drombeg in Co. Cork to see an ancient stone circle. The seventeen sandstone pillars that make up the circle are estimated to be around 3,000 years old. And was also likely the site of small village as a communal cooking pit and fresh water well have been discovered on the site. From Drombeg we went to Dunmanway in Co. Cork as a favor to my aunt whose grandfather grew up in the town before he came to America during the famine of 1847. We drove through Dunmanway and took some picture of the town for her and then we headed back to Blarney. On the way back to the Resort we stopped in Klonakilty Co. Cork. "Klon" is where Michael Collins grew up and there is a statue of him in the town square. We also marveled at the church turned post office. A nd the river that runs through the middle of town, literally some of the buildings are built on an arch so that the river flows under them. The day dawned bright and beautiful as we headed into town to see Blarney Castle. T'was a fine day for kissing of the stone. From the top of the castle you can see the town of Blarney and the surrounding countryside. There is not a guided tour through the castle but still, most of the rooms are marked as to the purpose of the room or who may have lived there so you are free to wander the castle at your leisure. There are extensive grounds to investigate as well. From the battlements to the smuggler's caves to the gardens and path's to follow there is plenty to satisfy a curious mind. Again the day dawned with sunshine in abundance, which was good since our plan for the day took us to Fota Wildlife Park in Co. Cork. Fota is Ireland's idea of a zoo but put from your mind anything you may recall about zoo's in the states. Most of the animals are free range; the only animals behind bars are the one big enough to trample or to eat people. Fota hosts one of the most successful Cheetah breeding programs in the world. There were several babies to observe while we were there. There are winding paths to take to different parts of the park. Our favorite was spending time with the Ring Tail Lemurs and Squirrel Monkeys that share tree space. You can walk into the trees where the animals are and watch the mischievous monkeys sneak up on the lemurs pinch them and scamper off to watch the lemurs go crazy jumping around from tree to tree. On the back side of the park is a large tidal basin and while we were taking pictures of the area Bryan noticed a really old but very cool looking tree so we wandered over to take a picture under it and that was when we realized we were being watched by a kangaroo. I have heard that roos can be very aggressive so I was a little worried but after watching us for a minute he turned and hopped away. We watched him and then decided to follow him at a safe distance. Around the bend we found a whole mob of lazy roos. There was nothing we could do that would get their attention to take pictures. The rain started moving back in so we had to dodge raindrops out of the park. The next stop was Cobh also in Co. Cork to the Heritage Center - The Queenstown Story. This visitor center tells the story of emigration during the famine years, from 1845 to 1950 it is estimated that some six million people emigrated from Ireland to America of the six million roughly two and a half million left from Cobh. At this same time frame Cobh was re-named after the Queen of England hence the name Queenstown; also leaving via Queenstown between 1791 and 1853 over forty thousand convicts t hat were shipped off to the Australian penal colonies. Cobh/Queenstown was not only a departure point for immigrants and convicts but also a port of call for transatlantic ocean liners. This is the point where hundreds of Irish immigrants boarded Titanic at her last port of call on her ill-fated maiden voyage to America. Daylight was rapidly ending so it was back to Blarney for our last night. In the valleys the clouds still hovered but there was a weak sun and rain everywhere else. We were off the see the donkeys of Liscarroll, Mallow in Co. Cork. Set in the beautiful rolling hills of Cork just outside the small town of Liscarroll is the Donkey Sanctuary. This operation has rescued over twenty four hundred donkeys from all over Ireland. Donke ys taken into the sanctuary's care are guaranteed loving care, fresh water, nutrient rich feed and cover from the weather for the rest of their lives. Donkey's are social animals and need companionship of their own kind. Great efforts are taken to pair up single donkeys and will ensure that donkeys that arrive with a buddy stay with their buddy. Donkeys will form new friendships, often with other donkeys closer to their age. This for many is the first time they have felt loving hands and kind voices. Many were abandoned or put in a field and given little or no attention after working for the owner for years pulling a cart or hauling peat. Donkeys require routine farrier care as the hooves never stop growing and with out proper care can injure, maim or even kill a donkey. After a time some of the donkey may even find a foster home. Once the application has been accepted and a home inspection has been performed and given approval two donkeys' can be fostered but are still owed by the sanctuary and must be returned to them if for any reason the foster owners are unable to care for them. There is a saying that goes; that it is easier20to adopt a child in Ireland then a donkey from the sanctuary. From Liscarroll we head off to Doolin, Co. Clare to the Sea View House B&B. We again got lost, several times and arrived in Doolin late in the evening. Between the dreary weather and the long drive we were done in at made an early night of it. The sun was shining but it was very windy and our first plan was to go to the Aran Islands however when the salty old captain at the ticket house said that today would be a good day to not be on the water, we decided to change the plan and go instead to the cliffs. (When the Ticket Agent agrees with you that the sea is a bit rough for a boat ride, it's time to go to plan "B".) Before we headed out we strolled through the town of Doolin, which consisted of a hand full of shops, one Pub, one music store, one bridge, one river and no st oplights. The Pub has a collection of Police Uniform Patches from all over the world on display. We were surprised to find many of the P.D. 's back home were represented, including the Department that Bryan works for. The music store boasts the interesting moniker of being the last music store in three thousand miles. After having some hot chocolate and pie at the music shop we headed up the coast a few miles to see the Cliffs of Moher, Co. Cork. The Cliffs are seven hundred foot high at the highest point and range almost five miles over the Atlantic Ocean. From the Cliffs you can see the Aran Islands, Galway Bay, Doolin Bay, The Twelve Pins, the Maum Turk Mountains in Connemara and Loop Head to the south. The Cliffs are home to one of the major colonies of cliff nesting seabirds in Ireland. The cliff area was designated a Refuge in 1988. Included in the designated site are the cliffs, the cliff-top grassland and a six hundred foot zone of open water, directly in front of the cliffs to protect a portion of the bird feeding area. There are several craft worker shops set in to the side of the hill, so as not to detract from the view. A restaurant that offers local produce, home cooked fare and a range of fresh seafood. There is also an interpretive exhibit housed at the center of the underground building called The Atlantic Edge Experience. The huge domed cave contains images, displays, exhibits and experiences. The dome is organized into four sections exploring different elements of the Cliffs of Moher: Ocean, Rock, Nature and Man. This is a great way to spend some time out in the fresh ocean air while enjoying a spectacular view. After time spent in the afternoon sun and cool breezes we were ready to move on to the next stop for the day and have a bite to eat. We set off for Moran's Famous Oyster Cottage on the Weir, Kilcolgan, Co. Galway. This family run business has been in operation dating back more than two hundred and fifty years. In the eighteen hundreds it did a flourishing trade when Kilcolgan was a prosperous little port. This area hosts the annual oyster-shucking contest that people from all over the world come and try and win the title of the world's fastest shucker. There is an inscription on the wall in the cottage that reads. "There is no better Oyster than one eats in Moran's bar. And people always come back here from foreign lands afar. Their Oysters are tremendous, and their other shellfish too. But try some Irish Coffee which can do such good for you. Then after all these Oysters and the Whiskey you drink here. You might see mermaids gently swimming in the Weir." After enough oysters and mussels to sink a ship it was time to move on the next port of call the Maldron Hotel Galway in Oranmore, Co. Galway. The weather was again a fine Irish mix of sun, mist and downpour so we decided to do some hard-core shopping. We headed to the Eyre Square Shopping Centre as well as great shopping opportunities there is also a Galway history lesson to be had. A major section of Galway's medieval town wall runs through the middle of the shopping complex. The Norman de Burgos who settled on the banks of the River Corrib in the 13th century built the wall. They felt they needed to build the wall to protect themselves from the native Irish. We walked over to the Claddagh Ring museum, which is both a museum, and jewelry shop dedicated to the history of this Galway made ring. Claddagh was a famous fishing village with a population of about three thousand a fleet of about three hundred fishing boats, it's own laws and it's own king. The name Claddagh, named from Cladach means "marshy ground" remained isolated and independent until sometime in the 1930's when modernization replace the thatched roof cottages with regular houses and many of the old tradition disappeared. The history of the Claddagh ring which means "faith" ring is probably the most culturally rich piece of jewelry ever recorded in history. The meaning, significance and history of the Claddagh ring has a rich ancient past that dates back to over 300 years. The design of the Claddagh ring and even the way the ring is worn are all deeply rooted in Irish tradition. The meaning of the Claddagh ring is what gives the ring its significance. Over the years the Claddagh ring has brought up designs with minor variations, the basic meaning and significance of the Irish Claddagh ring has however been retained. The hands of the ring are shown holding the heart and the hands denote friendship and togetherness, the heart itself signifies love and the crown in the Claddagh ring stands for loyalty. It is this meaning of the Claddagh rings that make them an ideal gift choice for all occasions. We continued our tour of Galway by car; we made our way to the docks, the beach and some other landmarks such as the Spanish Arch and Galway Crystal. The arch is a remainder of a 16th century bastion and was added to the town's wall to protect merchant ships from looting. The arch is so named due to Galway's merchant trade with Spain, whose Galleons often docked under its protection. The crystal factory was open for tours but we decided to just do some shopping instead. The crystal is fantastic and the showroom had treasures abounding but we only picked out a few pieces to bring home as gifts. We got up before the dawn to head up to Northern Ireland to go to Belleek, Co. Fermanagh to do the factory tour, which is about four hours away. It was a long but fun drive, the sun came up and the rain held off so we were able to see a lot of the countryside. There is a real difference in terrain from the low rolling hills of the south to the rugged soaring heights of the north. The factory is tiny compared to Waterford and you are not free to take picture except in a couple stops on the tour. But you do get to see the craftsmen and women busy at work making the delicate and intricate ceramic pottery. You are able to in most cases chat with the workers as they guide you through the process of completing a Belleek pottery piece from start to finish. We grabbed a quick cup of tea and then were on our way to Ballymote, Co. Sligo to visit a raptor sanctuary called Eagles Flying. The Irish Raptor Research Centre is a scientifically managed sanctuary for Bird of Prey and Owls. Established in 1999 the center was set up for research purposes only, but as a consequence of increasing interest and local awareness, it was decided to open parts on the complex to visitors. The scientists on hand present information on each of the birds and raptors in general. As the sanctuary became better known, people started bring in injured birds and other wildlife. They work to heal and if possible re-release these animals back into the wild and their natural homes. The hospital and rehabilitation is now the most time consuming and labor intensive department at the complex. You will see all manner of animals here, many different species of owls, hawks, falcon and eagles. As well as the feathered residents there are goats, turkeys, rabbits, guinea pigs, ferrets and donkeys. While there we watched two types of smaller hawks the Red-Tail and Harris' put on a flight show for us. The winds were still too high for the bigger birds but we did get to meet "Alaska" a young America Bald Eagle. We left the sanctuary to go find another stop on the agenda called Brigit's Garden in Moycullen, Co. Galway a nature center broken down into four gardens one each to represent a season cycle of the year and Celtic festival. The seasonal cycle mirror the cycle of life from conception to youth to old age to death. These are wildlife gardens, designed to reflect the West of Ireland landscape and managed to encourage biodiversity. The Four Gardens: Samhain (sow-en) - Winter - The festival falls on October 31st and marks the beginning of the year for Celtic peoples. It is a time of death and the promise of re-birth. Imbolc (im-ulk) - Spring - The festival falls on February 1st marked by the birth of lambs and the first snowdrops to herald this season of new life. Beltane (belt-an-a) - Summer - This May 1st festival celebrates the bright half of the year and the coming of summer's warmth. A time for the adventures of young adulthood and marriage. Lughnasadh (loo-na-sa)- Autumn - This early August festival marks the beginning of the harvest and the transition from summer to autumn, this is a time of plenty and celebration. The cycle is now complete and the possibility of re-birth beckons as a new cycle begins. Since it was getting closer to evening the temperature had dropped and the rain started in sheets so we started back to civilization and the hotel for our last night in Ireland. The last destination was the Lynch Clare Inn located in Dromoland, Co. Clare we of course got lost again trying to find the hotel, and then we drove right past it but finally made it safely to our final stop off. We unfortunately did not get there in time to see the sunset from the Sun Lounge; the lounge is situated to capture the unparalleled beauty of an Irish sunset. We had a meal in the Dining room while we played a guessing game to identify the instrumental show tunes that were playing in the background. After another fabulous meal we went back to the room to catch some TV and turn in early in order to catch our flight home the next day. While we were sad to be leaving Ireland we were looking forward to getting home. We did have the knowledge that we would be back in a scant few months but that was little enough consolation. P.S. We took about a thousand picture, literally and when we sent out our thank you notes to the people who contributed to the Traveler's Joy web site we included picture of the places they had "given" us. That was a really big hit, everyone was really happy to be able to see what we did with our time in Ireland.